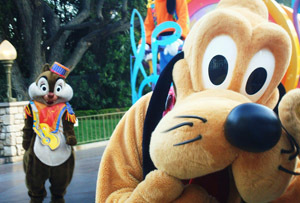 Euro Disney revealed an 8% fall in visitor numbers to its French theme parks. Businesses know some things are going to hurt regardless of how well they prepare - natural disasters and terrorist attacks being prime examples. So Euro Disney has had to brace itself for the financial impact of last November's terror attacks in Paris, much like easyJet. It said customers cancelling trips to France in the wake of the attacks contributed to an 8% drop in visitor numbers to Disneyland Paris and Walt Disney Studios from October to January. Euro Disney made it clear that its first quarter drop in revenue – down €337.6m (£263.4m) from €341.5m, was ‘primarily due to the November events in Paris’. Hotel occupancy was down 5,000 nights compared to the same period for the last year – driven by fewer guests visiting from the UK and the Netherlands – though there were more overnight French and Spanish guests; perhaps upping the numbers in an act of defiance. Higher guest spending and higher volumes were recorded in the first half of the quarter (maybe it's time to start reporting in eighths? ), but a flood of cancellations and the decision to close the theme parks for four days of national mourning (the first closure of its kind since the opening in 1992) impacted revenue. Hardly a decision you can begrudge the company for taking, but not really what Euro Disney needs as it struggles to cope with significant debts and a fall in visitor numbers over recent years - between 2012 and 2014, Disneyland Paris visitor numbers fell from 16m to 14.2m and in January 2015 shareholders approved a €1bn recapitalisation plan to try and turn things around. Euro Disney president Tom Wolber tried to provide some optimism. ‘Despite the softened environment, we remain confident in our long-term strategy and we are encouraged by the resilience of the French market in particular,’ he said. There are indeed some glimmers of hope for the most visited theme park in Europe. Visitor numbers actually rose to 14.8 million last year despite the attacks, and you’d imagine a steady recuperation of visitor numbers as Paris and the rest of the country pushes on in an effort to return to normalcy. Though, that's unlikely to have been helped by the recent news of a man arrested at Disneyland Paris carrying two handguns. The 4% rise in average spend per visitor is good news too – it helped to cushion the drop in customers at the end of the year and could provide a further boost if it continues in the coming months. Just ask any parent of toddlers about their 'Frozen budget' and you'll quickly realise that Disney's not going anywhere anytime soon. There were mixed fortunes for its owner Walt Disney – the company had a record quarter for sales and earnings, driven by Star Wars: The Force Awakens (what else?). The film juggernaut has already provided a boost to the cinema industry and boosted Disney's studio profits by 86%. But eagle-eyed investors were concerned by flagging profits at Disney’s media networks, including ESPN, ABC and the Disney Channel. Not even the force of Star Wars was enough to distract from that and shares fell 2.7% to $89.75 in after-hours trading.